Your roof is your home’s main protection from water, wind, and ice damage caused by the elements of nature. If it was installed correctly with high-quality materials, it should last you at least 25 years, if not a little longer. But, there will be a little maintenance required from time to time to keep it in good shape. The best way to maintain the integrity of your roof is to have it inspected by a certified roofing contractor on an annual basis. Champion Roofing has a Roof Maintenance program. Not only should you have an annual inspection, but you should also visually check the roof throughout the year, especially after strong storms, looking for any visible damage. Taking advantage of the expertise of a professional on a yearly basis is the key to your roof’s longevity. The roofing contractor performing the roof inspection will be looking for any unusual wear and tear on all of the different parts of your roof and the surrounding areas. Here are some of the specifics of what the contractor will be looking at. They’ll be looking at a few different aspects of the overall structure of your home’s roofing components. Any signs of sagging or shifting of any roof planes would be a sign of a deteriorating or compromised roof frame. Chimneys and chimney caps would be inspected, looking for cracks or anything else that would allow water to seep inside. The roofing contractor would also check any flashing issues at vent pipes and skylights. Soffits can be inside or outside of your home. On the exterior, they are on the underside of a surface that is exposed to the elements. Often used to connect the edge of the roof’s eave to an exterior wall, the final finish will match the other exterior features of the home. The inspector will be looking at the area around all of the exterior soffits to make sure there isn’t any damage that could cause water to invade to wood frame of the roof. If moisture is allowed to settle, it can both rot the wood and create an area where mold and mildew can grow. There are a few different things that are indicators that some shingles may need to be replaced. 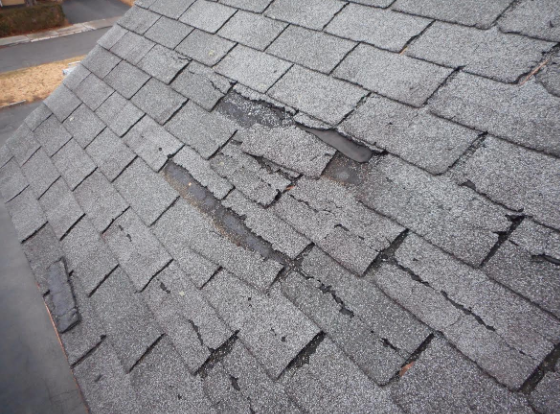 Missing or loose shingles: The wind is notorious for beating on the shingles on your roof, sometimes tearing them or even ripping them off altogether. In most cases, the repair is simply replacing the shingles. The worst-case-scenario would be water damage to the underlying wood caused by too much exposure to the weather. Shingle granules: The rough exterior surface of shingles is composed of granules that can erode and start to fall off. The inspector will be looking at the overall integrity of the shingles on your roof making sure that they are still strong enough to protect your home. Buckling or curling: Some areas of your roof may take more abuse than others, depending on their location. The shingles that get the most sunlight or are more vulnerable to the wrath of Mother Nature can start to buckle or curl, exposing the wood frame to the elements. Improper ventilation in the attic can also cause shingles to curl. A big advantage to having your roof inspected yearly is that issues like this are caught early, before any serious damage is done. Your gutters are the final extension of your roof’s ability to protect your home from water damage. All of the rainwater and most of the leaves and other debris that collect on your roof will eventually end up in your gutters. A roofing contractor will be looking at at a few different areas of your gutter system. Are they flowing? Leaves and other debris can sometimes collect inside of the gutters and create a dam, limiting or stopping the flow of water. The inspector will be looking for any blockages in the gutters or the downspouts. If there are any backups in the gutter system, the roofing contractor will be inspecting the roof around the backup. If water is allowed to pool on the roof, it can seep under the shingles and cause damage to the wood underneath. The contractor will also be looking at the overall integrity of the gutters. Are there any tears or holes? Are they still securely attached to the exterior of your home? Is the water flowing away from your home as it should? These are all very important aspects to maintaining the functionality of your roof. They’ll also be looking for any loose gutter granules that may have collected in the gutters or below the downspouts. One area of your roof that is prone to collecting water is the roof valleys. They are the inside corners where different parts of your roof meet. Often, rainwater will drain towards the valleys, where they will flow downwards to the gutters. The roofing contractor is looking for any unusual wear or areas where water may have settled. The roofing contractor will also be taking a good look at the area at the very edge of the roof, making certain that the material is in good shape and resistant to water. Anything that is protruding from the roof will have a watertight barrier around it that can erode or become damaged over time. The contractor will be paying special attention to vents, chimneys, fans, or anything else on the roof where a potential leak could occur, making sure that any flashing is intact and in good shape. They will also be looking for any signs of moss, algae, rust, or other roof stains growing on the roof. While it can usually be cleaned off, it can sometimes mean that the shingles may be reaching the end of their lifespan. The nails attaching the shingles to the roof can sometimes work their way out, creating protrusions that can trap debris making it possible for water to pool. Protruding nails usually only need to be hammered back into place, although it can indicate an issue with the quality of the wood underneath. The attic will also need to be inspected. Sometimes, water damage that isn’t apparent by examining the roof’s exterior can be detected on the ceiling of the attic. The rafters along with all of the wood components of the wood frame would be thoroughly inspected for any signs of water damage. A roofing contractor will also want to take a look at the interior of your home for any signs of either water damage or moisture. Sometimes, water can make its way inside of your home, and not be evident until it starts to cause damage. Moisture inside of your home can also be conducive to the growth of mold, which can cause serious health issues. The cost of a new roof can be substantial, especially if the wood frame is damaged. While you should always routinely inspect your roof, it’s really worth the investment to have it professionally inspected once a year. It’s the best way to get the longest life out of your roof.